Dragon’s Domain Records, to be distributed through buysoundtrax.com, presents the premiere soundtrack release of FAST COMPANY, featuring music and songs produced by Fred Mollin (FRIDAY THE 13TH: THE SERIES, TEKWAR, FOREVER KNIGHT) for the 1979 racing drama directed by David Cronenberg (SCANNERS, THE FLY, DEAD RINGERS, CRASH, A HISTORY OF VIOLENCE), starring William Smith, Claudia Jennings, John Saxon, Nicholas Campbell, Don Francks, Cedric Smith and George Buza. Released in 1979, FAST COMPANY follows the men of a racing team sponsored by international oil company Fast Co as they compete on the racing circuit, travelling across Canada, occasionally crossing over into the United States. Aging drag racing star Lonnie "Lucky Man" Johnson (William Smith) is the star of Fast Company. Lonnie's protégé Billy "The Kid" Brooker (Nicholas Campbell) competes in the Funny Car class, trying to make a name for himself. Fast Co team boss Phil Adamson (John Saxon) just wants to make sure that they can keep Lonnie’s car running and not go overbudget while using Lonnie’s name to help sell Fast Co product to the public. Lonnie’s direct competition is Gary "The Blacksmith" Black (Cedric Smith). As tensions escalate between Adamson and Lonnie, Adamson decides to fire the whole team and hire Black to take over as the new driver for Fast Co, which sets off a chain of events that will ultimately prove to be fatal for some of the people involved. FAST COMPANY is a forgotten gem from the late 1970’s. At the time, director David Cronenberg was just beginning to establish his career as a unique storyteller, primarily making horror films in Canada such as SHIVERS and RABID, grounded in the reality of horrifying situations that might be caused by a mutation, a parasite or certain kinds of medical conditions. What the world didn’t know at the time is that the director was also a huge car racing fan and FAST COMPANY gave him the opportunity to focus his attention to detail on a different kind of story. 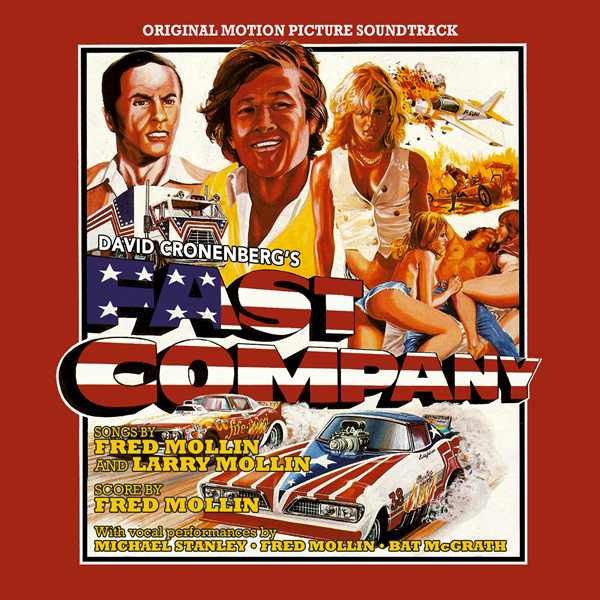 Fred Mollin was hired by producer Michael Lebowitz, a longtime friend, to provide music and songs for FAST COMPANY. Mollin wrote the songs and composed the score; Mollin’s brother Larry provided lyrics for three of the songs, including the title number. Mollin had been successful at the time as a record producer and also as a single/songwriter. Lebowitz was looking for music for the film that would be evocative of Bruce Springsteen. In the studio, Mollin assembled a great band to play with. Steve Lukather, who went on to fame as lead guitarist for Toto, and is considered to be one of the world’s greatest electric guitar players. Mike Porcaro, who was also a part of Toto after the first bass player left. Ed Green on the drums, Mollin on guitar. And John Jarvis played all the keyboards, Finally, Dan Ferguson, son of composer Alynn Ferguson, played electric rhythm guitar, a popular studio musician at the time. He played the guitar for the BARNEY MILLER theme. Michael Stanley of the Michael Stanley Band performed vocals on two songs for the film, ‘Fast Company’ and ‘Let Us Run Wild’. The music was mixed and recorded at Westlake Audio by Mick Guzauski, one of the great mixers of rock music. FAST COMPANY was Mollin’s first scoring assignment. Fred Mollin first came into international prominence as a record producer in the late 70's, producing numerous albums and singles, including the Grammy award-nominated ‘Sometimes When We Touch’ by Dan Hill. In the early 1980's, Mollin based in L.A. and Toronto to start a 17 year run as a composer for television and film. His work has run the gamut from high tension (CBS-CBS TV's Gemini award-nominated child abuse drama LIAR LIAR and CBC's LITTLE CRIMINALS, the award winning drama about young offenders) through fanciful flights of adventure (William Shatner's TEKWAR and USA Network's BEYOND REALITY) to the darkest reaches of the medium (Paramount's FRIDAY THE 13TH television series and movies, and MGM-UA's THE OUTER LIMITS). His work on such cult series as Tri Star's FOREVER KNIGHT and hit mainstream series such as Fox's BEVERLY HILLS 90210 and Paramount's HARD COPY were an integral part to the success of these classics of TV entertainment. Mollin also parlayed his songwriting, especially from his Disney years of experience, to be one of the main composers and lyricists for songs on the award-winning Disney Channel series, HANDY MANNY. Mollin continues to work in the film/TV arena, especially in music supervision and direction, as well as writing title themes and songs. 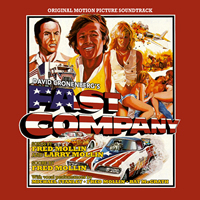 Dragon’s Domain Records is excited to announce the premiere soundtrack release of FAST COMPANY, featuring music and songs produced by Fred Mollin, mastered from the composer’s own elements by James Nelson at Digital Outland. The booklet contains liner notes written by author Randall Larson featuring the participation of the composer. FAST COMPANY is a limited edition release of 1000 units. FAST COMPANY will begin shipping the week of March 13th, 2017. The first 100 copies ordered through the website will include a booklet autographed by composer Fred Mollin.